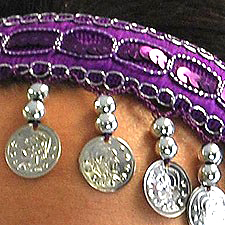 This beautiful comfortable headpiece is the easiest way to add a finishing touch to your Belly Dance costume. 2 uses for the price of one !!! I used this headdand as a headband but I also wear it around my neck as a neck adornment!Many women in my class have asked me where I purchased it.I sent some business your way!